I taught a Web Dev class this morning and then taught an English class this afternoon. After that, we all headed to the University as the band was leading music at Student Service this evening. The fruit is about the size of a cantaloupe, but it is covered with huge spikes. When you crack it open, it had several several compartments where the fleshy fruit part is. The texture of the fruit is very unique… It is kind of mushy on the inside but has a type of “skin” on the outside… Imagine the mushy inside of a mango, and then put it in a thin sandwich bag. Now take a bite! In all actuality, the taste got better with every bite! Between myself and two other guys, we ate the whole thing in about five minutes. The only bad part is that it makes your fingers and breath smell just like the fruit (or old trash, depending who you are). Either way, this served as a great bonding experience for me and my Malaysian brothers. As a matter of fact, we really had a good time talking crap and making fun of each other, which was very comforting as I really do miss the banter that can only happen with my friends / family. After a good hand scrubbing and a handful of mints, it was time for service. The band played great and Ross delivered a really good message on what it means to be “Salt and Light” from Matthew 5:13-16. 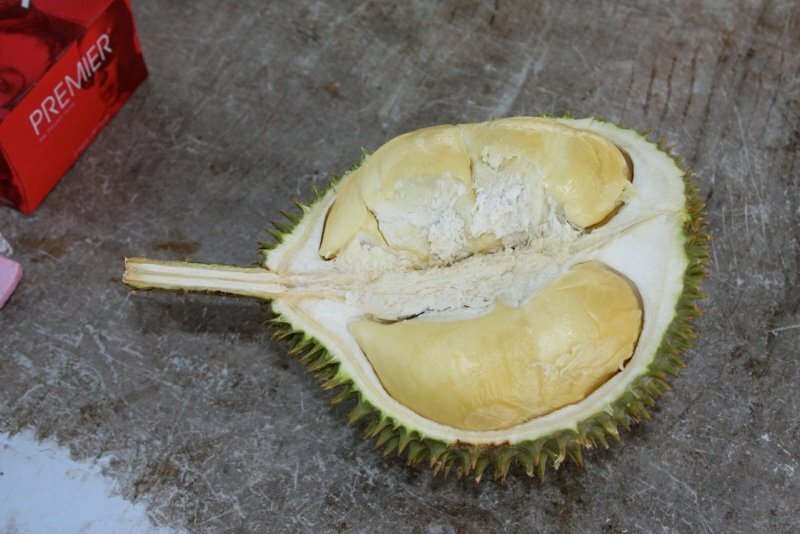 Afterwards, I partook in another round of durian with the guys. All is well with the world. Almost forgot! The highlight of my day… At around 11:00am this morning, I went to take a shower and for the first 90 seconds the water was coming out warm!!! Not quite hot, but it was definitely not the usual ice cold. And for those 90 seconds, my hopes got higher and higher that I might actually have a hot shower… But all hope died as the water chilled once again. Either way, 90 seconds is better than zero.